Welcome to my Starbucks Verismo resources page. Below you’ll find a list of Verismo related blog posts that I’ve written so far: reviews, cleaning guide, Verismo recipes, plus a shopping list. I wanted to put everything in one basket because it can come in handy and also save your time. Starbucks Customer Service help is available Monday – Friday, 6 a.m. – 3 p.m., at 1-800-334-5553 and 1-877-421-9062. Starbucks is closing its online store in October 2017 and they no longer will be selling machines, parts or coffees online. If you need a replacement reservoir for your Verismo machine or any other part, I recommend to check on eBay or even better, contact Starbucks customer service and ask for a specific part. Disclaimer: Some of the links are affiliate links. Hello there! Thanks for your informative site. I recently purchased a Verismo 11 5M40 coffee maker unfortunate in transit, it arrived with the water reservoir shattered. The seller refunded me but I am still left with a beautiful non functioning machine. I looked online for a replacement but the ones I found were very described to be compatible to 11 5P40. Is that part compatible with my model ? Thank you! Hi I was just wondering if you sell a replacement part for the water tank itself? If so how can I get one and how much would it be. Hi Wyatt, we don’t sell machines or parts. I’ve checked Amazon and Ebay for you, but couldn’t find a replacement reservoir for Verismo machine. I recommend to contact Starbucks customer service, they should have all parts. Starbucks Customer Service help is available Monday – Friday, 6 a.m. – 3 p.m., at 1-800-334-5553 and 1-877-421-9062. I hope this helps! I have recently got a verismo k-fee machine but the holder for the pods is missing internally so the machine can’t actually hold a pod in from the top of the machine. Is there any way a replacement could be gained for this ? Hi Joe, they don’t sell replacement pod holder on their website. You will need to call Starbucks Customer service and see if they can service your machine or send you the part. Starbucks Customer Service help is available at 1-800-334-5553 and 1-877-421-9062. Please try descaling your machine. 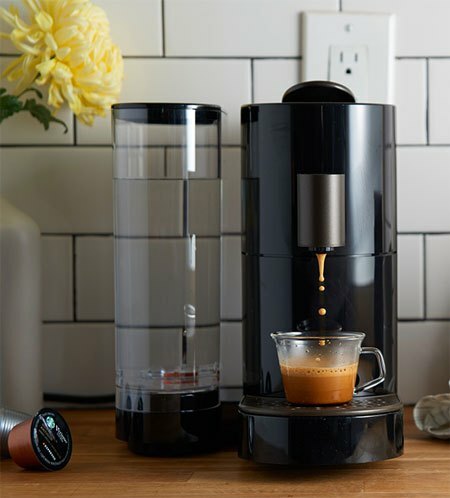 You can find a detailed step by step guide for descaling your Verismo V in this post. If this does not solve the problem, I recommend to call Starbucks Customer service so they can help troubleshoot your machine. Thank you. When will this part be back in stock? Hi Lynn, the coffeestylish .com is a personal website/ brand and is in no way sponsored, endorsed or administered by Starbucks company. I see they don’t have the drip grate in stock, but I have no information about when it will be back. Normally, I know the items are back in stock in 1-2 weeks but can’t say for sure. For this, please resend your email to official Starbucks Verismo support email: verismocare.us@starbucks .com or call Starbucks Customer Service at 1-800-334-5553 and 1-877-421-9062. For everything else I’m here to help. Thank you.